Chipotle are at again. The brand which has won over global audiences with its highly emotive animated music videos and a satirical web TV series, has launched a new branded arts project - this time Chipotle has turned its attention to the world of literature. The new initiative, called ‘Cultivating Thought’ author series will see essays and musings from ten well known authors appear as thought provoking art works on the brands packaging. The idea was the brain child of novelist Jonathan Safran Foer, (‘Extremely Loud and Incredibly Close’ and ‘Everything Is Illuminated’), who recruited another nine writers for the project. The list includes Safran Foer, along with Nobel and Pulitzer Prize winning novelist Toni Morrison (Beloved), Michael Lewis (Moneyball), Malcolm Gladwell (The Tipping Point), Steven Pinker (The Blank State), short story writer George Saunders, Pulitzer Prize winning journalist Sheri Fink and comedic writers Sarah Silverman, Judd Apatow and Bill Hader. The works, which are a mixture of essays, fiction, comedy and though-provoking ideas, will feature on the previously blank packaging including paper bags and cups. Chipotle has no involvement in the content creation, it merely provides the medium for the work. 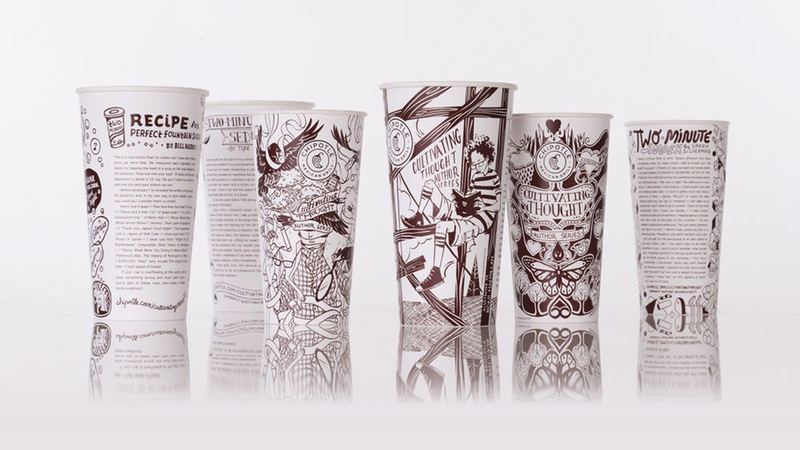 Chipotle is the not the first brand to provide interesting content on its packaging for customers – but it is the first to recruit some of the brightest and most creative minds to provide the content. 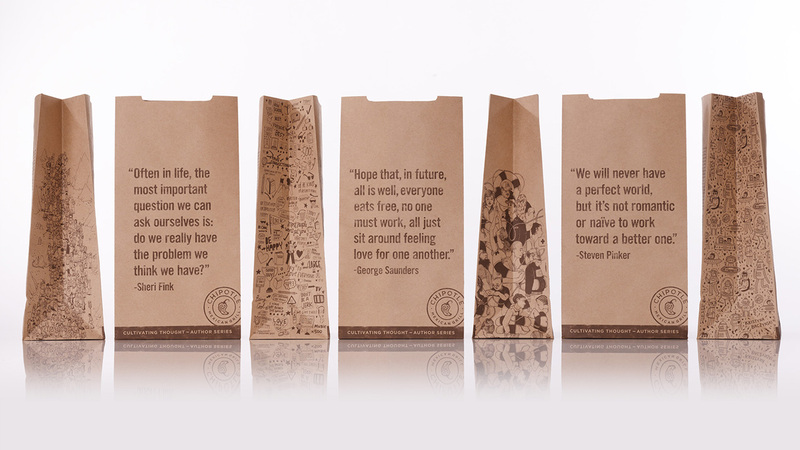 Aligning the brand with these leading writers is a serious coup for Chipotle. Many of these writers are hugely respected and admired by the literary world and of course adored by readers. This association helps open the brand to new audiences who may be tempted in-store to read and even collect these pieces. The mere exercise is certain to attract the attention of the literary world and give the brand yet another reason to secure headlines. It is also serves to validate and reinforce the integrity of Chipotle’s honest sustainability messaging and deliver this to new audiences. For the writers it’s an interesting opportunity. The project provies them with a potential opportunity to grow their readership base, however in doing so they are aligning with a multi-national corporation – something the literary world has rarely done. It is perhaps a sign of the times and the changes within the publishing industry, that these writers jumped on board. Safran Foer said the project was a great way to provide literature to those who lack access to libraries and bookstores. This is a really refreshing idea to provide entertainment to people while they are in-store and or engaging with the brand and its product. It’s a lovely idea and incredibly simple, so it will be interesting to see what becomes of this project. In some ways a project like this was only a matter of time away, we’ve seen brands collaborate with musicians, singers, fashion designers, directors, and visual artists but very few have looked at the opportunity of writers and authors – Blackberry’s collaboration with Neil Gaiman is one standout example. Qantas has also made interesting moves in this literary branded arts space with ‘Stories For Every Journey’ a project which saw the airline create bespoke novels which were designed to be read within your journey time. Can we expect to see something similar from Chipotle in the future? This ‘Cultivated Thoughts’ project is beautifully simple, and it leaves you pondering what might come next? Will Chipotle produce a book? Perhaps a collection of the packaging art, but who knows? When it comes to Chipotle it’s fair to say there will be much more to come. In the meantime you can read some of the works on Vanity Fair.